Yes! We offer a 100% money-back guarantee. If you are not satisfied with the service experience you received from us, we will rush back to your location at no change and no obligation. If you are still unimpressed, we will issue a 100% refund up to $1,000.00 upon request. 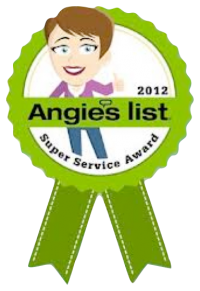 Our mission is to provide our clients with the most outstanding cleaning experience at every visit! Most carpet manufacturers recommend having your carpet professionally deep cleaned once every 12-18 months. If you have children or pets, you may want to have your carpet deep cleaned at least twice per year. If your carpet is under warranty, we highly recommend that you look over your carpet manufactures warranty for details on how often the carpet should be professionally cleaned. Which cleaning method do I need? There are two professional cleaning systems, Interim Cleanings & Extraction Cleanings. All carpet manufacturers recommend scheduling an extraction cleaning periodically, approximately once every 12-18 months, to remove accumulated soil and grime that is not removed by vacuuming or spot cleaning. There are 3 major types of extraction cleaning systems: (1) Hot Water Extraction, (2) Dry Foam, (3) Rotary Shampoo. The majority of carpet manufactures recommend using the "Hot Water Extraction" method for restorative deep cleanings. An interim cleaning system, either dry compound (dry extraction) or absorbent pad (rotary bonnet), can be used to improve the carpets appearance between extraction cleanings. All interim cleaning methods should be followed with periodic extraction methods. If you have a situation that requires dry cleaning, Carolina Carpet Cleaning is experienced in various dry cleaning applications and can apply that method for you. In order to preserve carpet finishes and life, as well as any applicable warranties, use your carpet manufacturers' recommended cleaning system. What cleaning method do you use to clean carpet? We specialize in deep cleaning carpet using the most effective carpet cleaning method that is recommended by nearly all Carpet Manufactures - Hot Water Extraction. It is the only carpet cleaning method that can remove soil and residue from deep down in the fibers. It is also the most effective method in giving restorative deep cleaning results. Both Shaw Industries and Mohawk, who work together to manufacture more than two-thirds of the worlds carpet, recommend the “Hot Water extraction” system for restorative deep cleanings. How does "hot water extraction" work? High-pressure forces of hot water, combined with light cleaning detergents, are propelled into the carpet, loosening dirt, soils, and grime. In almost the same motion, the suspended soils and hot water are extracted by a powerful vacuum suction generated by our truck-mounted vacuum pump. Carpet is immediately rinsed with hot water to completely flush out all cleaning detergents, leaving each carpet fiber residue-free and ph balanced. Additional passes with the carpet wand are made using vacuum suction only to ensure the maximum amount of water is extracted out from the carpet. Where can I find my carpet manufacturers cleaning recommendations? Most carpet manufactures have a Carpet Care and Maintenance guide available on their website, which includes information on which deep cleaning system is recommended for your carpet. We also have access to the most current list of carpet manufacturers and their recommended deep cleaning systems for quick reference. We would be happy to assist you in finding your carpet manufacturers cleaning recommendations. Is hot water extraction safe for my carpet? Our system is safe for cleaning all types of carpets, including wool. Are your cleaning solutions safe for children & pets? We proudly offer Green Cleaning Solutions as well as Anti-Allergen cleaning solutions, designed for those who surfer from allergies, asthma, or chemical sensitivities. Our anti-allergen solutions remove soil and grease from carpet, upholstery and mattresses - with fantastic results! Hypo-allergenic, non-toxic, biodegradable, and environmentally safe. Do not contain pesticides, perfumes, harmful solvents, or other hazardous ingredients. Let us know about any preferences you may have, we'll be happy to accommodate the right cleaning solutions for your home! Carpet will be dry-damp after cleaning and should be dry in 3-6 hours. Factors that can change drying times include weather conditions, room temperature, and air flow. We use air movers to speed the drying time. We also advise our clients to ventilate the house by opening windows if outdoor weather conditions permit, or set your air conditioning temperature at 72 to 78 degrees Fahrenheit. Carpet can take up to 12 hours to dry if the temperature is cold, indoor/outdoor climate conditions are damp, or the room is closed off with poor ventilation. Can "steam cleaning" cause mold or mildew growth? Carpet is made up of synthetic fibers. Mold & Mildew simply cannot grow on synthetic fibers. Soil embedded deep in the carpet pile can be a food source for supporting the growth of mold and mildew. Carpet cleaning removes soils from the carpet pile - which eliminates any concerns regarding mold and mildew growth on carpet. No, although hot water extraction cleans deep down in the carpet pile, the moisture does not penetrate the backing of the carpet due to our powerful truck-mounted vacuum system and high velocity air movers. Will there be a detergent residue left behind that causes rapid re-soiling? Detergents assist in dissolving oils and effectively removing sticky residues that attracts soil, however if it is not thoroughly rinsed out of the carpet, then it can act as a sticky residue attracting new soils to adhere. Re-soiling is easily prevented by thoroughly flushing out all detergents with hot water - which is an important step in our carpet cleaning process. What are these dark or grayish lines on my carpet? This is called filtration soil. Filtration soil occurs when microscopic soils are deposited in the carpet pile over a significant period of time. It is often caused by an improperly balanced ventilation system, when the volume of air entering a room exceeds the systems capacity to remove air from the room. This forces air to pass through gaps along baseboards, stairways, doors, ducts, and draperies. Can it be removed? Filtration soils may require special cleaning treatment for effective removal. It is difficult to remove because the soil particles are so fine that they penetrate deep into the carpet pile, sometimes into the backing of the carpet. With special products, time and effort, reasonable results can sometimes be achieved. Can I prevent filtration soil? There are a few things that should help prevent filtration soiling. 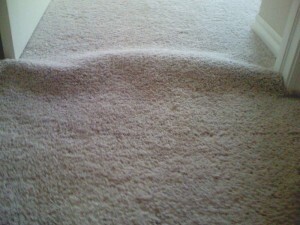 (1) Vacuum the edges of the carpeting on a regular basis. (2) Change your vacuum filter before its full. (3) Frequently dust all areas of your home. (4) Keep indoor air clean by changing the air filters in your heating and cooling systems on a regular schedule. (5) Be sure the openings through the carpet and under doors and baseboards is properly sealed to prevent filtration soiling. Would it be more cost effective to have my carpet professionally cleaned less often? When it comes to quality carpet care and maintenance, there are two important factors in preserving your carpets appearance and maintaining a healthy indoor environment: (1) Regular Vacuuming, (2) Periodic Deep Cleanings. Regular vacuuming removes dry surface soils and makes carpet easier to maintain. But even with regular vacuuming, soils will become embedded in the carpet pile and build up over time. Soil acts an abrasive against carpet fibers and causes premature wearing of your floor investment. Periodic deep cleanings will remove soil buildup, improve indoor air quality, and keep your carpet looking great for its full lifetime. Following your manufacture's carpet care and maintenance plan is critical to ensure carpet wears well, keeps its good appearance, and has a long use-life. Get ready for updated cleaning information at your fingertips! We are currently behind the scenes putting together all the information we want to share with you! Visit us again soon! How often should I have my upholstered furniture cleaned? Manufacturers recommend cleaning upholstery once every 12-24 months. How long will it take for my upholstered furniture to dry? The typical drying time is between 6-12 hours. There are several factors that determine the drying time for upholstery, such as the cleaning method used, application of fiber protection, indoor temperature and humidity level. Why is it important to have my grout sealed? 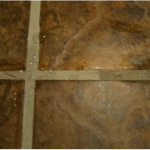 Grout sealers will help prevent spills from penetrating into the porous surface of the grout (see picture below) and gives you time to clean it up. Simply blot fresh spills with a clean cloth or paper towel. The sealer continues to protect even after repeated cleanings. 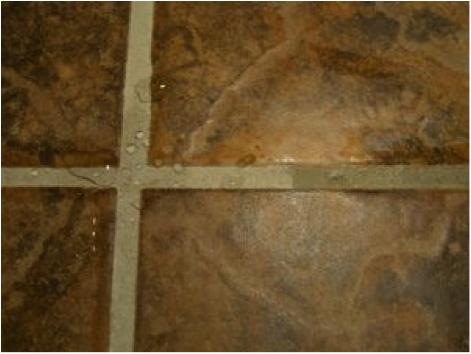 Essentially, sealing grout with a "quality" grout sealer is the only way to protect your investment from water-based and oil-based stains. Does my ceramic tile need to be sealed? No. The ceramic tile is sealed in the manufacturing process but the grout between the tiles should always be sealed. How does a sealer protect my floor? The penetrating sealer is absorbed by the Natural Stone or Ceramic Tile Grout. It fills up the "nooks and crannies" with the sealer solids so that when spills occur (oil or water based) the liquid cannot get below the surface, and it sits on the surface of the grout, allowing you to wipe it away. What do sealers protect against? A penetrating sealer repels water-based and oil-based liquids and beverages and protects the surface from dirt and impurities. Keep in mind that your grout can still get dirty, even if it is sealed with a quality grout sealer. It will simply clean up with less of a chance of a stain occurring. 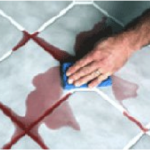 If you want your grout to actually be "Stain Proof" you will need to have your grout color sealed. Does a sealer alter the appearance of the grout? No. Not our clear sealers. They protect without changing the original color, texture, feel or appearance of the surface. However, we also offer color-enhancing sealers for natural stone, marble, granite, limestone and masonry surfaces as well as our color sealants that can change you grout color to whatever color choice you may pick. Yes and No. Most professional grade sealers are quite expensive. Some sealers purchased at big box stores are not. We use only professional grade sealers and we do not use box store sealers. Our sealing programs on the other hand are very affordable and can actually SAVE you money in cleaning and replacement costs. How is a sealer applied? First, the floor is professionally cleaned, neutralized and fully dried. Then, the sealer is applied using professional equipment and allowed to soak into the grout and/or natural stone for approximately five to ten minutes. Finally, the excess sealer is removed from the surface using a floor buffer and allowed to dry. Why is it necessary for a professional to apply sealer? Can't I do it myself? Our professionals have the training, experience, tools and a wide variety of sealers for all types of natural stone, tiles and grout. Professional application ensures complete protection for the entire surface of the floor. Improper sealing can also leave a sticky residue on the surface of the floor that is difficult, if not impossible, to remove. How should I maintain my sealed floor? We will help by educating you on the correct maintenance procedures for cleaning your tile and grout and most importantly what to stay away from in terms of cleaning solutions that might have an adverse affect on your newly sealed grout. We offer an excellent line of suitable cleaning products through our company and typically supply you with a bottle, free of charge, to get you started. *It is important to use the right cleaning solution, as the wrong type can actually break down the sealer and render it useless. Will my floor ever have to be professionally cleaned and sealed again? Yes. We can provide periodic maintenance cleanings and re-seal your grout (when needed) to keep your floors in top condition. The frequency will depend on the amount of traffic on them, frequency of spills, your cleaning habits, etc. A grout sealer will essentially make maintaining your floors much easier and more effective, but not maintenance free. What are the advantages of having a Color Sealer applied to my grout? 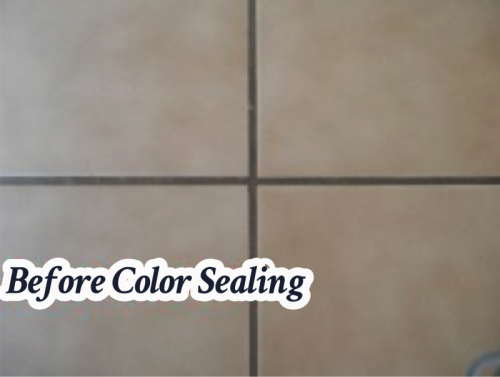 While a normal clear sealer can give you great protection from stains, having a color sealer applied can truly make your grout lines stain proof. Basically, your grout line becomes waterproof and stain proof. Also, any dirt or spills can be cleaned up with even more ease than that of a clear sealed floor. At the same time it will also block out any stains or color blemishes that may already exist in your grout lines giving your grout a more uniform appearance and making it look new again. What areas in my house can you Color Seal? We can Color Seal most tile surfaces including floors, walls, counter tops in your kitchen and baths and on some occasions your shower surround. Typically, the tile needs to be a man made product like ceramic tile or porcelain tile and the grout needs to be a sanded grout for the sealer to bond properly. What do these Color Sealers protect against? Our Color Sealer repels water-based, oil-based and some mild acid based liquids (like coffee and red wines); prevents stains caused by most foods; and protects the surface from dirt and impurities. It also contains agents to reduce mildew and bacteria from forming in it. Can you match any existing grout color? Yes. We can match nearly every grout manufacturer's color palate and you can choose virtually any color you would like. So, if you are not completely happy with your existing grout color we can change it to any color of your choice. How long does Color Seal Protection last? Under normal use if the tile and grout are maintained properly, the protection should last for approximately 5-10 years before any touch-up work would be needed. *We also offer a lifetime guarantee on any floor that has been color sealed by us and is cleaned and maintained by us on an annual basis. This guarantee states that if the sealer starts to break down at any time, while we are maintaining it, we will touch up any of the areas free of charge, ensuring that you get a lifetime of protection and beauty for your grout. What does a Color Sealed floor look like? The grout will look new again with a glare free, uniform color throughout. Call us today and we can show you a sample area on your tile floor that has been Color Sealed so you can see for yourself, first hand, how beautiful and maintenance free your floor can really be. How is the Color Seal applied? First, the floor is professionally cleaned, neutralized, and fully dried. Then, the sealer is applied using professional equipment and allowed to soak into the grout. The excess is now wiped up using a dry cloth. How soon after the Color Seal has been applied can we walk on the tile floor? The Sealer will be dry enough to walk on as soon as the job is complete. Typically, it takes about 2 hours to dry and it is fully cured within 2 weeks. Why is it necessary for a professional to apply a Color Sealer? Can't I do it myself? Our professionals have the proper training, experience and tools to do the job right the first time. 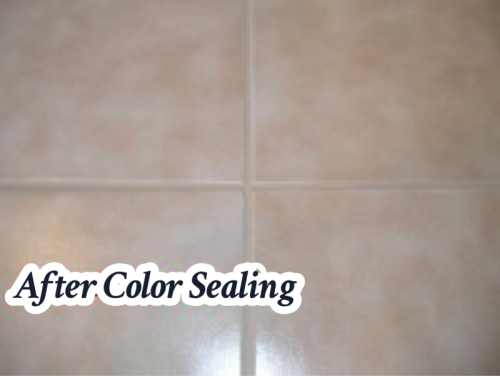 One of the most important steps in applying this type of sealer is grout preparation. This is achieved by using our state-of-the-art tile and grout cleaning equipment and our 8 step cleaning process. A professional application also ensures complete protection for the entire surface of the floor. Proper application of the Color Sealer is an art that is learned through training and practice. It is difficult to master this process in one attempt and not recommended. Why are my carpets bubbling up or waving, and how do you fix it? I can give you two answers for the first part of the question here. #1: Over time, depending on wear, the carpet backing can become looser from wear and tear and the carpet can lose it's initial stretch from installation. Typically this should not happen for at least 5 years after installation based on average wear. That brings us to #2: Improper installation. If your carpeting has become loose before 5 years on average wear, I would believe it was installed poorly, simple as that. I installed carpet for years and I was trained by a professional carpet installer. He trained me very well, and always insisted on using a knee kicker in conjunction with a power stretcher. I have seen the results of poor installation way too often. Now, I will answer the second part of the question. How do I fix it? I own all the equipment to properly reinstall the loose or wrinkled carpet. First I will go in and anaylze the carpet and determine to best route for the loose carpet to go, depending on walls, hallways, other rooms that could get affected, and so on. Then I will pull the carpet up from the tack strip that I want the loose carpet to go toward. I will use a powerstretcher and push the carpet toward the exposed tack strip and use a knee kicker to tack the carpet back into place. Last I will trim up the extra carpet that is now stretched properly into the tack strip.